What: You just tried on your favorite pants; only problem? Your dry cleaner must have shrunk them (ha-ha) because you can’t get them buttoned. Why: The holidays are over, and you’ve gained a bit of weight. Although, it’s not always fat that we gain, sometimes it can be excess water. On average, our bodies can carry 6 pounds of extra water weight. Does that make you feel any better? Eat a protein rich breakfast. The protein will keep you fuller, longer. The longer you stay full, the less likely it is that you will be to grab a sugary, carbohydrate-rich snack. Cut back on carbs. When you eat carbohydrates (bread, rice or cereal) your body will “hang onto” excess water. In fact, for every one gram of a carbohydrate you eat, your body will hold onto two grams of water. This excess water will usually gather right around your waistline, making it difficult to button up your pants. If you cut back on some of the carbs, you will lose some of the water weight. Drop the salt habit. Yes, an obvious choice, but did you know that most of us eat at least 40% more salt than our bodies can handle? If you eat too much salt, your body will hang onto excess water weight, making you feel bloated and puffy- never a good combination! Increase your exercise this week. Exercise works as a natural diuretic, flushing water through your system and out through your skin as sweat. Cut back on your evening meal. Eating fewer calories at night means you store fewer calories as fat while you sleep. This is not a short term fix for weight loss, but adopting this habit will help you to lose or maintain your weight. Eat more citrus fruit this week. Citrus is a natural diuretic, it works quickly and the effect will last for hours. 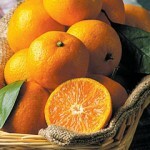 Try eating a Clementine or Satsuma orange after a meal. For women only: Eat or take more calcium. Women who don’t get enough calcium are more likely to be bloated. Your daily dose should be about 1,200 mg pre-menopause and 1,500 mg post menopause.